The combination of unfettered corporate greed, a eugenics agenda and corrupt political manipulation forms an unholy trinity that could make Monsanto the real Cyberdyne Systems. In the Terminator movies, Cyberdyne Systems created the artificial intelligence computer system Skynet, which destroyed most life on earth and forced survivors to live underground. Proving once again that fact is indeed as strange as fiction, the Monsanto Company could single-handedly cause TEOTWAWKI (The End Of The World As We Know It). Monsanto was started in St. Louis, Missouri in 1901 by John Francis Queeny, whose background was in the pharmaceutical industry. Beginning as it would continue, the first product made by Monsanto was saccharin, a controversial artificial sweetener now banned in many countries for its links to cancer. Over the last century, Monsanto was responsible for bringing many controversial substances to the market. Initially a chemical company, it wasn’t until 1982 that Monsanto branched into agriculture, immediately tying the chemical background to the formerly wholesome business of growing food. 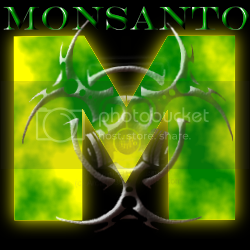 Monsanto was determined to improve on nature and by the late 1980s had begun trials with genetically modified crops. Monsanto is no stranger to either side of the courtroom. In effort to eradicate the family farm, Monsanto has taken many farmers to court for patent infringement. Farms unfortunate enough to be downwind of Monsanto have been sued because of cross-pollination with Monsanto plants from neighbouring farms. Because these farmers did not purchase seeds from Monsanto, they were “stealing” the benefits of this genetic engineering, and thus, successfully sued until they lost their businesses to the greedy company. A group of more than 300,000 organic farmers recently took a page from Monsanto’s book and sued the company because they found through testing that their crops had been “tainted” by genetically modified plants growing nearby. The case, unfortunately, was dismissed. Part of the reason Monsanto has been so successful in the courtroom has been the company’s incestuous ties to the US de facto government. Despite the blatant conflicts of interest, Monsanto executives have held Cabinet, judicial and policy-making positions in the Bush, Clinton and Obama administrations. When you’re sleeping with the enemy, the enemy tends to get away with all manner of crimes. Elena Kagan: Obama Solicitor General (when she famously took Monsanto's side against organic farmers in the Roundup Ready Alfalfa case) àUS Supreme Court justice. Clarence Thomas: General Counsel for Monsanto àUS Supreme Court justice. Monsanto’s collusion goes further than mere ties with government. The power-mad and wealthy seem to be magnetically drawn to the company. Recently, public depopulation proponent Bill Gates bought half a million shares in Monsanto and began “gifting” Monsanto seeds to farmers in Third World countries. These farmers will be permanently tied to Monsanto, as the self-terminating seeds will have to be repurchased every year. Monsanto’s Board of Directors has ties to corporate giants such as McDonalds, Cisco Systems, Sara Lee, Lockheed Martin and Proctor and Gamble, to name a few. Monsanto has sponsored exhibits at Disneyworld and Disneyland. Monsanto has tentacles in the following companies through mergers and spin-offs: GD Searle, the Nutrasweet Company, Pharmacia, Upjohn, Eli Lilly & Co., Seminis, Delta and Pine Land Company, and De Ruiter Seeds. Perhaps the most disturbing issue with Monsanto and their products is the fact that the genetically engineered food is simply untested – we don’t know the full repercussions from eating this stuff. Other studies have shown disturbing results like stomach lesions, increased risk of anaphylactic shock, increased antibiotic resistance, and toxins in the bloodstreams of newborns. We aren’t allowed to be warned about GMOs either. Although Obama promised labeling of GMO foods appearing at your local grocery store, it’s yet another campaign promise that has never been fulfilled. The state of Vermont is currently being sued by Monsanto for labeling GMO foods. The FDA has also refused to force GMO producers to label their food. At this point, the only way you can be sure you are getting your food as nature intended it is to pay high prices for organic foods. Monsanto has changed the face of world agriculture to the point that each trip to the grocery store results in a lottery of genetic mutations. Will the tomato that you eat today cause bleeding ulcers tomorrow? Will the gmo corn that insinuates itself into 90% of processed foods cause your child to have a resistance to antibiotics that might otherwise save her life? Are you missing important nutrients by consuming these foods, causing you to overeat to attempt to satiate your need for vitamins and minerals? Monsanto has been publicly accused of mishandling toxic chemicals. Many of the items the company has brought to market have since been banned, which suggests proper testing was not done in the first place. With all of Monsanto’s criminal accessories in the US de facto government, as well as Big Pharma and other corporate entities, is it any stretch to question the company’s mutation of our food supply? Amidst all of this genetically modified abundance, wouldn’t it be ironic to perish from malnutrition? With the world’s farms as its gameboard, Monsanto is aggressively taking over agriculture. As mentioned above, one of the primary ways Monsanto removes the competition is through lawsuits that regular farmers can not afford. Another tactic used by Monsanto is that of genetically engineering seeds to be self-terminating. Quite simply, Monsanto seeds can be used to grow one plant. The time-honored practice of carefully harvesting seeds from plants so that they can be reused will not work with Monsanto seeds because they have been sterilized. The donations of Monsanto seeds to Third World countries is, then, somewhat akin to the drug dealer who gives his clients a “free sample” for their first hit. The client has no choice but to come back. The creation of the self-terminating seed causes a revolving need for more seeds every year. If plants grown in subsequent years are found to have some residual DNA from previous Monsanto plantings, the farmer knows he will be sued and lose everything. The farmer is unable to propagate from previous crops. Monsanto has created a customer who has no option but to purchase from them year after year. As a method to take over the world, what better way than to control the source from which all food comes? If the ONLY seeds are one day these modified sterile creations, what happens when those seeds disappear? What happens if Monsanto stops producing the seeds? What if seeds become regulated and only distributed in certain amounts to certain growers? Are you and your family prepared for a coming food shortage? Check out this solution! Starvation on a scale more massive than the world has ever seen occurs. Control is complete and absolute. This is the ultimate power.